Today in Grand Rapids, Michigan the world’s most democratic art prize founded five and a half years ago is launched – ArtPrize is a 19-day free for all where artists may show their work within a three-mile radius of the city. You the viewer are given a mobile app, or you may use your home computer and you may vote on one of the 1,500 works on display. The prize’s web site has clocked 118 votes as of this writing. Once the public weighs in, 10 finalists will be chosen. From this people’s choice list a jury will preside for final deliberations. These jurors include Anne Pasternak, Executive Director of Creative Time, and Mel Chin the artist, they are based in New York and North Carolina respectively. Last year’s winner (taking home $200,000) was a California-based teacher, Adonna Khare. Her work during ArtPrize was in the Grand Rapids Art Museum during the viewing period. 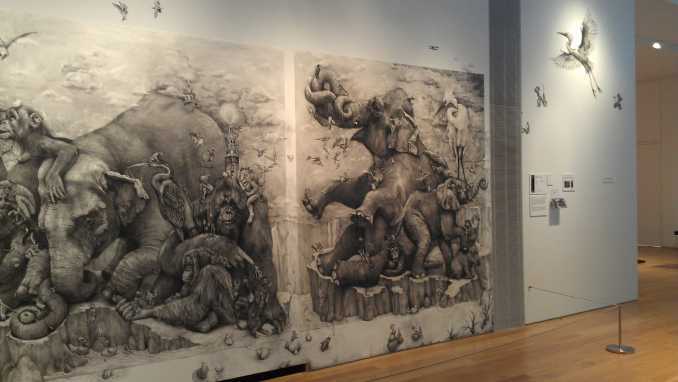 It was a giant pencil drawing called “Elephants”. I wonder how one gets into the museum to be viewed during this special 19-day period versus the local Grand Rapids cafe? There must be committees within committees that may be less democratic than the intent of the prize. In 2011 the winner was Mia Tavonatti, of Santa Ana, California, she made a stained glass mosaic “Crucifixion.” No urine, no dung, no irony or twist, just a painstakingly rendered glass mosaic of Jesus on the cross. In 2009 the artist Rob Bliss coordinated a paper airplane launch of 100,000 paper planes off the tops of several buildings, all coordinated to the song “Olsen Olsen” by Sigur Rós. This was a youtube hit, but not a prize winner. The founder of the prize is from the family of Amway founders, Rick DeVos is a philanthropist, entrepreneur and art lover. His approach to a community-based art prize is commendable. In fact I love the idea. 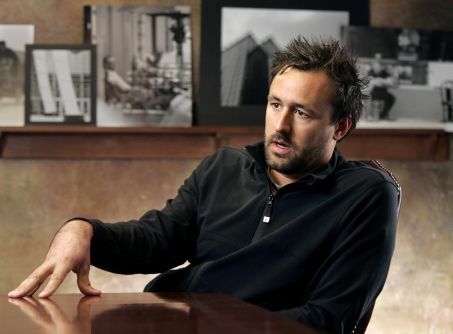 Among his other projects as an entrepreneur include ReindeerCam. I look forward to utilizing this tool during my family’s Christmakkha season. Despite this prize as being the world’s largest ($560,000 to be distributed to 16 categories, including a $200,000 people’s choice award), there is no mention of this prize being launched on the veritable Art Newspaper web site today. The prize throws into question all of the usual comfort zones of the art elite – authority and taste. There are more prestigious prizes, and of course artists clamor for those, as these are the “art world’s” stamp of approval (eg. Max Mara Prize for Women Artists, Turner Prize, Guggenheim’s Hugo Boss Prize). There is a heavy cost to these efforts, DeVos estimates that this year there is a $3 million dollar budget to cover buses, printing of a guide, and web site development. The city estimates the 19-day art festivus of viewing brings the city of Grand Rapids, Michigan close to $15 million in revenue. Art does sell doesn’t it? Wishing all of the hopeful participants of this year’s ArtPrize the best of luck, and for the jury I hope there are some gems in the group that find their way to the top of the pile for your consideration, how thrilling! !